Well our morning started out early, with a decent Yellowtail bite in the dark. Most of the Yellowtail were in the 25 to 35-pound range. But all good thing come to an end, the Sharks moved in, and it was game over. 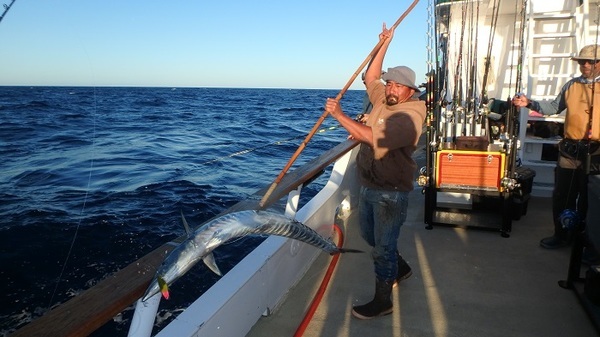 We pulled our anchor and headed back to Alijos rocks, started looking for some Wahoo. It was a very slow morning, so Roy made the decision to try for some Cabrilla. We caught a handful of Cabrilla, and headed back to the Alijos bank. We arrived to what was a great show of Marlin. The Marlin were eating the dropper-loops, Iron, sinkers. You name it they tried to eat it. We did manage to get a couple of Wahoo. The morning was a bit slow on the Wahoo and Yellowtail. We headed back to the rocks, and bingo. We found a small bunch of Wahoo. The goal was to get everyone onboard a Wahoo, and mission accomplished. Everyone has at least one Wahoo to take home. We stated until sunset, and we are now headed north. We will be traveling for the next 30 hours, before arriving to our next destination. We will be looking for kelps tomorrow for Dorado, so wish us luck.